Phytophthora cinnamomi is a soil-borne water mould that produces an infection which causes a condition in plants called “root rot” or “dieback”. The plant pathogen is one of the world’s most invasive species and is present in over 70 countries from around the world. 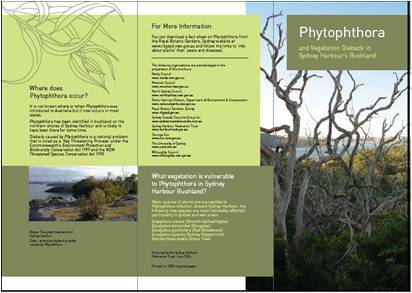 The SCCG was a member of the Sydney Harbour Federation Trust’s Phytophthora Working Group. The working group was formed in response to a number of localised Phytophthora outbreaks around the Sydney Harbour region and consisted of Local, State and Commonwealth Government land managers in the Sydney Harbour region. An education campaign to inform people how they could prevent the spread of the pathogen. Guidelines for the design and construction of walking tracks, including boot cleaning stations at entry and exit points. Implementation of best practice procedures for people undertaking bush regeneration activities. Mapping and monitoring infected and uninfected areas and dieback. New plantings with Phytophthora resistant species in infected areas.